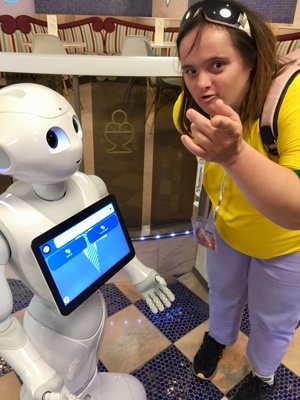 Shona, 37, was born with Down syndrome and as Australia recognises Down Syndrome Awareness Month in October, her message is simple – every person with Down syndrome has something to offer and given a chance can make significant contributions to society. For Shona, one of those contributions is as an author, publishing her own book of poetry and art entitled The Beauty of Life. The book is a combination of artwork by professional artists and Shona’s own watercolour pieces and original poems. But the Tweed Heads local’s greatest contribution is undeniably her advocacy work, encouraging others like her to share their story. Shona and mother Penny recently attended the World Down Syndrome Congress in Glasgow, Scotland, where Shona presented on her life and experiences with the NDIS. “I gave a speech on my life, on me, and I talked about the NDIS and what it means and what it stands for, and how it’s helping me to grow,” Shona said. Shona, who joined the NDIS 18 months ago, receives funding for support workers from local provider Social Futures to help assist her with daily tasks and to stay active in her community. Shona is a regular visitor to AFL and NRL games, and enjoys travelling to Sydney and Melbourne when she can. Penny said these things have been made possible because of the NDIS. “It’s been great for Shona, and also for me and our family. Shona echoed her mother’s sentiments. “I’ve got a great team of support workers, it’s amazing what people can do. I’ve had a very positive experience with the NDIS,” Shona said. The next step for Shona is to look for ongoing employment, which her NDIS funding will support her with. While her career interests are in management and human resources, she wants to continue advocating for those who need it, and Penny says it’s something her daughter was born to do. “I got thrown into this advocacy role 37 years ago when Shona was born, so I’ve been advocating for a long time.